Like liquor sales during a recession, Nick Blackburn’s play has remained relatively unaffected by the carnage that has piled up around him in 2011. The 29-year-old righthander has posted a stellar 3.47 ERA and hasn’t given up more than 5 earned runs in any of his 13 starts. A beacon of consistency during a season gone mad in Twins Territory, Blackburn discussed his team and the life of a starting pitcher with me before Friday’s game vs. Texas at Target Field. DZ: You had a pretty good start last night - didn’t get the win, but pitched well. The team has been playing a lot better lately, what do you think has been the difference? BLACKBURN: We are finally getting some stuff to go our way. We are getting the big hits - the hits are falling whenever they need to fall. It seems like for the last month or so, everything that could go wrong was going wrong for us - balls weren’t falling, pitchers weren’t throwing strikes. Lately we’ve been throwing it over the plate, making guys hit the ball and fortunately, they’ve been going at people. We are just executing all the way around, everybody on the team has been executing pretty well lately and I think that’s the big key for us. DZ: When you are a starting pitcher and it’s your night to pitch, you have a lot of control over the game and the rest of the time…you are kind of a spectator, what was it like seeing the team lose like this, when you’ve never really experienced that before? BLACKBURN: It’s been tough. All the stuff that this team has gone through so far this season, with all of the injuries - it’s not just a few injuries here or there, it’s guys all of the time. We get somebody back off the DL and someone else goes on it. It’s just been one of those things, we haven’t been able to keep everyone out on the field. It’s just been a tough battle for us. All of the guys we have on the DL and all the new guys up are starting to step it up. I think that’s been a big key for us. DZ: Do you ever kind of lose track of who is up or down? BLACKBURN: Honestly, it’s never a shock to see a new face in the clubhouse at this point. It’s good that all of these guys are coming up from Rochester and helping out. We can’t wait for everyone to get back healthy again and hopefully we can keep this momentum going that we have right now and just continue to win some games. DZ: When you come out of a game like last night, that’s tied or really close, what is your routine? Do you stay in the dugout or go into the clubhouse? BLACKBURN: There is stuff I need to go get done. Obviously there are TVs everywhere in the clubhouse. I continue to watch the game and I am cheering the guys on, but also I have to go in there and do cool down workouts and ice and take care of everything physically that I need to get done. All of the starters do the same routine; I think everyone takes it in after the inning is closed out. You definitely keep watching and paying attention and cheering on your teammates. DZ: As a starting pitcher, you spend a lot of time watching other pitchers - charting pitches and that kind of stuff. Who are some of your favorite pitchers - outside of your teammates - to watch? BLACKBURN: Really, when I am trying to chart, I watch all righthanders face the lineup we are about to face. Even if it is a guy that doesn’t particularly have the same stuff that I do or doesn’t have the same motion or whatever. I like to watch them all. I just kind of go through, I see the series that these guys have been playing and watch their films and try to learn what I can on those hitters. DZ: Are there any pitchers that really impress you? BLACKBURN: There’s a lot of them that are out there. There are some really good guys, you know. I can’t think of anybody right now off the top of my mind. There are definitely some impressive pitchers out there. DZ: Going back a couple of years, you started game 163 (in 2008 in Chicago) and Thome hit the homerun off you that ended up beating you (1-0). Have you guys ever talked about that? BLACKBURN: Yeah, a couple of times. It comes up occasionally. I mean, at this point, it is what it is. Thome has hit a lot of homeruns off a lot of people; I am not the only one on this staff that has given up one to him. Thome is a great teammate and we’ve talked about it several times and every once and awhile, someone will make a joking comment about it. He’s not the only guy I’ve given up a homerun to and he’s not going to be the only one. DZ: Does it make you feel any better that at least it’s someone like him who has 600 homeruns instead of some guy who hit a fluke homer? BLACKBURN: Yeah, he’s such a good guy, you know. You want good things to happen to good people. Obviously, I don’t want to go out there and give up a homerun, but the fact that it is Jim Thome and he’s a great guy and great teammate and all that stuff, you can’t help but be somewhat OK about it if you are going to be OK with it at all. DZ: You don’t have to be embarrassed anyway. BLACKBURN: That’s very true. If the guy is chasing down 600, I don’t think there is anything to be embarrassed about. 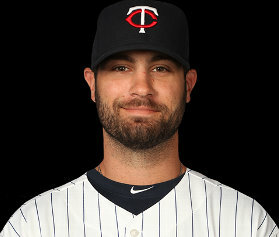 This entry was posted on Friday, June 10th, 2011 at 9:51 pm	and is filed under MLB, Twins. You can follow any responses to this entry through the RSS 2.0 feed. You can leave a response, or trackback from your own site.